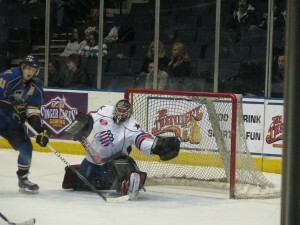 Amerks Sabotage an Excellent Game For Brodeur · Let's Go Amerks! Considering how badly the season has gone, it wasn’t until the 27th game of the season that the Amerks were shut out for the first time. They lost to the Peoria Rivermen (currently in 2nd place in the Western Conference) on Friday night by the final score of 2-0. 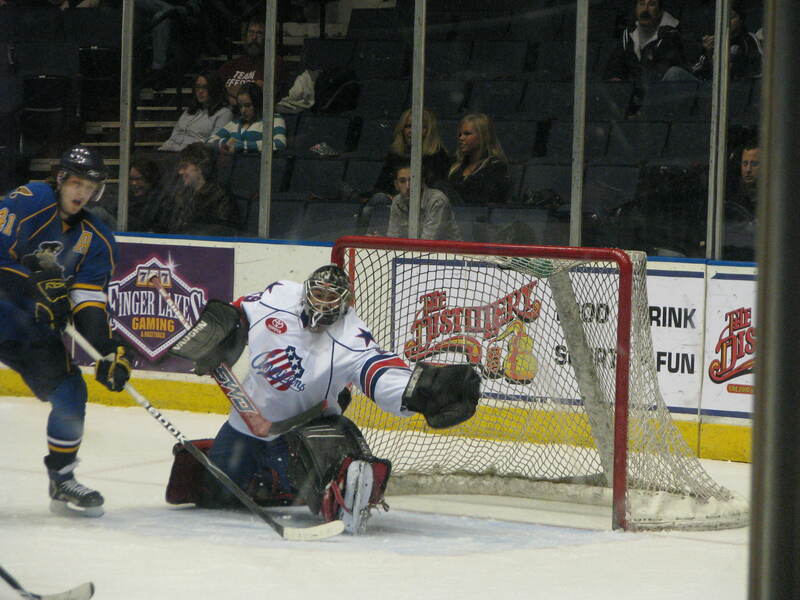 The Amerks sabotaged an excellent game from goaltender Mike Brodeur. This was the Amerks fifth game in seven nights for both teams, the key difference appears to have been the Amerks not being able to overcome a full day of travel on Thursday. Mike Brodeur was the star of the game for the Amerks, he received possibly the largest cheers from any Amerk home crowd this season with amazing saves every chance he had. He finished the game with 27 saves, many of them worthy of a highlight film. “I’m feeling it right now, the puck just seems to hit me and feels good,” commented Brodeur. Brodeur has quickly become the #1 star of this team amongst fans, and he feeds off of that. “It’s fun when the fan gets into the game, they make us play better and stronger. It’s what we need right now,” he said. Unfortunately he seemed to be the only one feeding off of the fans. The team only had two shots in the first period, six in the second, and nine in the third. The Amerks also had four power play chances but were not able to even come close to scoring on any. The game was scoreless until 6:02 of the third when Tyson Strachan was finally able to beat Brodeur. The Rivermen had great puck movement and after 25+ shots at Brodeur they finally found a way to beat him. Even though the game was scoreless after two periods of play the game wasn’t even close. The Rivermen were getting the puck moved around, getting shots through to the goaltender, and simply put they seemed to have a system and were able to execute. That’s a total change from the way the team has played in their previous three games. They were creating offensive scoring chances and executing. With just over two and a half minutes left in the game and the Rivermen only having a one goal lead the Amerks were given a power play opportunity. Delay of game penalties have been a thorn in the side of the Amerks all season, now they were given a chance to tie the game in the closing minutes because of one. With the 5 on 4 advantage the Amerks were trying to get a play setup when a pass by Jacob Micflikier was intercepted by Josh Soares who strolled in on Brodeur and more or less put the final nail in the coffin for the night. While newcomer Brodeur stood on his head all game, that wasn’t the case for the rest of the team. Whether it was a well built Rivermen defense or lack of a “system,” the Amerks were not able to muster anything together. “To me i thought the team together, the leaders of the team would come up hard in the third and take charge but obviously that was not the case, ” Groulx said about that. The Peoria Rivermen are a good team, while the Amerks had no system, no ‘A’ game, and no offense, they still did not get blown away by a team that is tied for second in the Western Conference right now. If it’s easy to blame tonight’s game on the travel schedule then it’s not looking good for the rest of the weekend. The team is currently on a bus driving to Cleveland where they play the Lake Erie Monsters on Saturday. After the game they’ll be heading back to Rochester to play the Syracuse Crunch on Sunday night. This stretch of seven games in nine nights is the toughest of the season, assuming the team can find a way to play the system and bring an ‘A’ game it is entirely possibly we’ve climbed out of rock bottom. We have a solid goaltender. Players are improving. It’s possible things are starting to come together. Groulx would not comment about who would be playing the rest of the weekend. He seems reluctant to name a starting goalie and typically the goaltenders don’t know who is starting until later in the day on game day. The only injury I know of was Karl Stewart who left half way through the third period after taking a shot to the wrist. He said that nothing is broken and doesn’t anticipate missing any playing time.